We have a family tradition to celebrate Passover by gathering around our table and sharing a special meal. As we enjoy the meal we remind ourselves of how God rescued those who had followed His instructions to paint the blood of a lamb on their doorposts. You can find this story in Exodus 12:12-13. This year we enjoyed the week of Easter in late March, but with spring break travel, sports, church attendance, and more … I was sad to see that we were unable to set aside time to celebrate with our traditional Passover meal. Imagine my surprise and joy as I discovered that Passover 2016 was NOT the same week as Easter! Passover 2016 begins April 22. We still had time to celebrate our Passover meal! When I learned this, I was overcome with a sense of God’s mercy and a fresh falling awe of His second chances. On a piece of paper I wrote In This Season and began to make a list of all the things I needed to talk to God about … current happenings in my family, problems I was experiencing in this season of life, and issues that needed hope, help, and healing. My list included names of friends and family, sickness and diseases, personal struggles and sins. In black ink I wrote my own sinful attitudes followed by the mindset I wanted to trade them for. I also listed things I am hoping for in the future. As I humbly thanked my Savior and desired to express my love and gratitude, I took a green pen representing growth, and began to write in smaller letters in a diagonal direction some of the verses in Psalm 103… He forgives; He heals; He redeems; He crowns with love; He fills my life with good things; He renews; He gives justice. Will you join me and make a list of your own? Write down the struggles you are facing in this season of your life. Are there areas in your personal walk with God that have become dormant or stale? Are you ready for the Lord's plow to work on that dry and dusty, fallow ground? If so, write it down. What about those closest to you? Have they been bitten by the frosty wind of your cold heart? Don't be ashamed to bring these confessions to God. 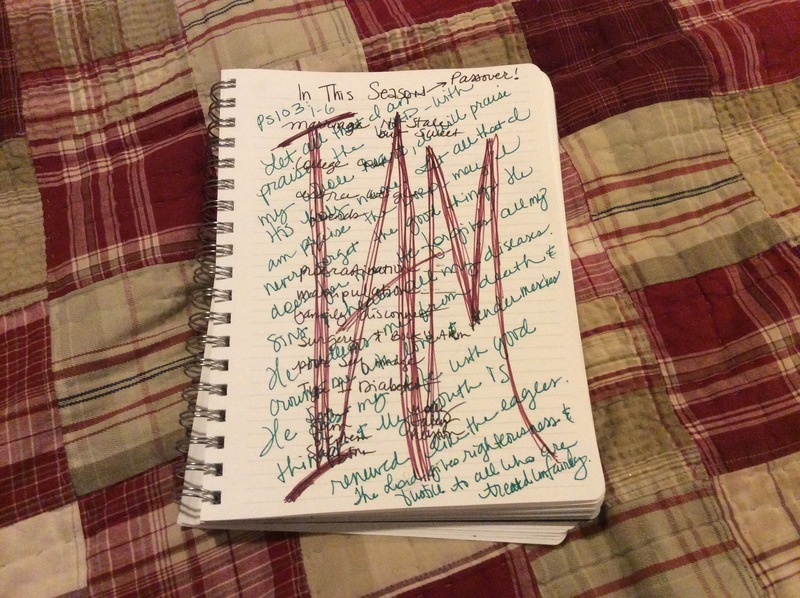 When you have finished your list, grab a red pen and BOLDLY write "I AM" over all of it. Then praise God with a song of gratitude like the one in Psalm 103. Thanks to Susan Peacock for sharing her FaithStory today. What’s your story? We’d love to hear from you at http://debbieh@gfbc.org. Previous Article Pit of Despair! You have such a precious heart! Thank you for sharing. What an inspiration! Love you!